The NBA 2K19 20th Anniversary Edition includes the following digital items: NBA 2K19 20th Anniversary Edition: Anniversary Edition Bonus. There are more ways than ever before to spend your VC. Upgrade your MyPLAYER, buy MyTEAM packs to build your perfect fantasy team, and so much more. A casual dress and stylish kid’s clothing inspired by the southern sea and flowers. You can buy it at any time in the game shop (Clothing Store in Castle St.) when you purchase it. Over 100 levels nestled in carefully crafted landscapes, soothed by the sound of seagulls, frogs or water splashes. 7 chapters combining : 12 different types of swimmers, 12 different objects to interact with, 6 disruptive environmental elements like waves, crabs or jellyfish that will give your brain a work out until you swim out! Ninja Commando is an action game released by SNK in 1992. Fight to protect history from death merchants planning to bring chaos to the world. Shoot, use Ninja Tricks and Death Blows, and accumulate scrolls to perform Transformations for a variety of attacks. Two-player simultaneous play is also available. Gakuen Club is a school life romance game set in a famous private academy. The game features unique and distinct characters with their own stories and outstanding voice work. Help the Robo Chicken get the stolen light bulbs back. Fly, run, dash and put your skills to the test. The most entertaining Pinball is back. Enjoy Mummy Pinball, a perfect reproduction of a real pinball machine, with all the graphic details and sounds. Discover all the secrets, complete all the missions and become number one in the world or the best among your Friends, posting your high score on the online leaderboard. NBA 2K celebrates 20 years of redefining what sports gaming can be, from best in class graphics & gameplay to ground-breaking game modes and an immersive open-world “Neighborhood.” NBA 2K19 continues to push limits as it brings gaming one step closer to real-life basketball excitement and culture. The NBA 2K19 20th Anniversary Edition includes the following digital items: NBA 2K19 20th Anniversary Edition: Anniversary Edition Bonus. Shikhondo: Soul Eater is a Korean bullet-hell shoot ‘em up set within a beautiful and bizarre world of Asian mythology. Armies of demons known as yokai have escaped from Limbo. They are spreading like a plague across the land, sowing fear and stealing souls. You must destroy the pestilent invaders and free the captured souls from eternal torment. In Slice, Dice & Rice, a single, clean hit will determine the victor. The winner of the duel is determined by one’s mastery of Parry and Shingan. Parrying your opponent’s attack will place you in an advantageous position. The Shingan will assist you in dealing with incoming attacks. Once activated, time slows down, making it easier to parry your opponent’s attack. NBA 2K19 includes the following digital items: NBA 2K19 20th Anniversary Edition: Locker Codes-Pre-Purchase Bonus. Play through the Knight campaign as you battle against the tribal Lizardmen or enjoy the ground-breaking PvP combat system that will deliver fast-paced real-time strategy action or tactical turn-based gameplay. Multiplayer allows either game mode, while single-player focuses entirely on real-time strategic gameplay. Didn’t fancy seven years at medical school? Skip straight to the operating table with Surgeon Simulator CPR, fully revived and feeling better-than-ever on the Nintendo Switch. Now featuring all-new motion control functionality as well as local co-op play, it’s time to scrub up for the most immersive version yet of the infamous operation sim. Battle, sneak, and charm your way through thousands of story options as you play through over a dozen major quests, each unique to a different Hero. The world-famous indie RPG Undertale comes to Nintendo Switch. Fall into the underworld and explore a hilarious and heart-warming world full of dangerous monsters. Date a skeleton, dance with a robot, cook with a fishwoman… or destroy everyone where they stand. The future is yours to determine. Players can team up with up to three other friends either locally or online to fight towering Big Bosses, using skills and powerful Soultimate Moves. While previous YO-KAI WATCH games focused on turn-based battles, Yo-kai Watch Blasters drops you into real-time skirmishes, in the first-ever action RPG for the series. 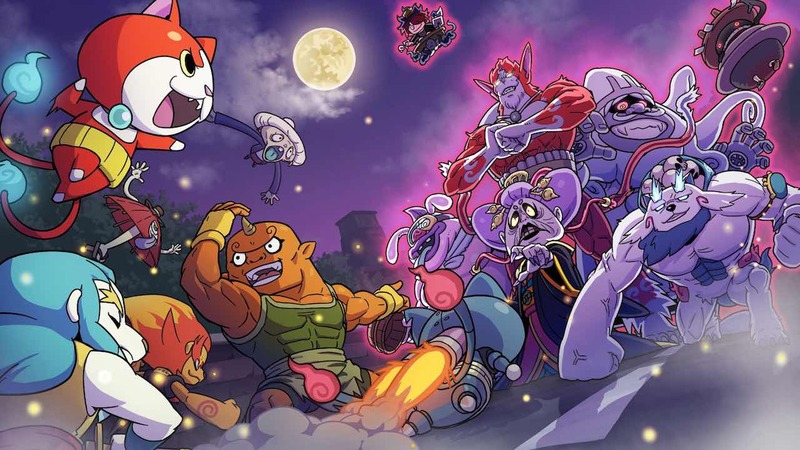 Each of the two versions of the game contains different Yo-kai, missions and bosses. By trading between the two, you can collect all the Yo-kai!